Place water, onions, garlic and mushrooms in a large pot. Cook, stirring frequently, until onions soften and being to take on a golder color, about 10 minutes. Stir in remaining ingredients. Bring to a boil, reduce heat and simmer for about 1 hour, stirring occasionally. Do not cover. 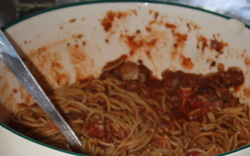 Server over whole wheat pasta or rice.